ایلاغی, حسین, یمینی فرد, فرزام, تاتار, محمد. (1389). تحلیل پس‌لرزه‌ای زمین‌لرزه 5 فروردین ماه 1385 فین (MW = 5.9) (ایران- زاگرس). مجله ژئوفیزیک ایران, 4(1), 17-32. حسین ایلاغی; فرزام یمینی فرد; محمد تاتار. "تحلیل پس‌لرزه‌ای زمین‌لرزه 5 فروردین ماه 1385 فین (MW = 5.9) (ایران- زاگرس)". مجله ژئوفیزیک ایران, 4, 1, 1389, 17-32. ایلاغی, حسین, یمینی فرد, فرزام, تاتار, محمد. (1389). 'تحلیل پس‌لرزه‌ای زمین‌لرزه 5 فروردین ماه 1385 فین (MW = 5.9) (ایران- زاگرس)', مجله ژئوفیزیک ایران, 4(1), pp. 17-32. ایلاغی, حسین, یمینی فرد, فرزام, تاتار, محمد. تحلیل پس‌لرزه‌ای زمین‌لرزه 5 فروردین ماه 1385 فین (MW = 5.9) (ایران- زاگرس). مجله ژئوفیزیک ایران, 1389; 4(1): 17-32. از آنجا که هنوز ارتباط مشخصی بین چین و گسل در کمربند چین و تراست زاگرس وجود ندارد، با بررسی پس‌لرزه‌‌های یک زمین‌لرزه بزرگ، می‌‌توان به بررسی ارتباط بین این ساختارهای زمین‌ساختی (تکتونیکی) پرداخت. از طرفی روش‌‌هایی چون مدل‌‌کردن امواج حجمی، حل تانسور ممان و یا در برخی موارد استفاده از تصاویر ماهواره‌ای قادر به تعیین صفحه گسل نیستند. بررسی پس‌‌لرزه‌‌های یک زمین‌لرزه یکی از راه‌های تشخیص صفحه اصلی از صفحه کمکی است. لازم به ذکر است که روش‌‌هایی همچون ساختارهای عمومی لرزه‌خیزی در منطقه نیز می‌تواند ما را در تشخیص صفحه اصلی از صفحه کمکی یاری دهد. 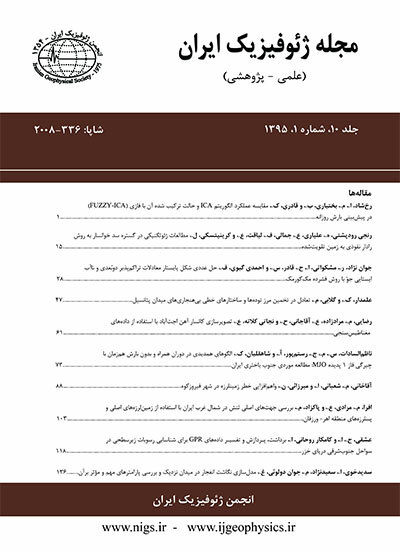 در ساعت 58 :10 روز 5 فروردین 1385 زمین‌لرزه‌‌ای با بزرگای گشتاوری 9/5 در بخش فین استان هرمزگان به وقوع پیوست و باعث ایجاد خسارات جزئی در منطقه شد. پس از وقوع زمین‌لرزه اصلی، 4 پس‌لرزه با بزرگای بیش از 5 مجدداً منطقه را به لرزه درآورد که سازوکار محاسبه شده برای آنها مشابه زمین‌لرزه اصلی از نوع معکوس است. در این مقاله نتایج حاصل از آنالیز پس‌لرزه‌‌های ثبت شده با شبکه موقت محلی نصب شده در منطقه آورده شده است. توزیع رومرکز پس‌لرزه‌‌های این زمین‌لرزه پس از تعیین محل به روش تفاضل دوتایی روند شرق-غرب را نشان می‌دهد و توزیع پس‌لرزه‌‌ها در عمق نشانگر شیبی به سمت شمال است. این شواهد زلزله‌شناسی وجود فعالیت لرزه‌‌ای روی گسلی با امتداد شرق-غرب و شیبی به سمت شمال در منطقه را تایید می‌کند. با توجه به مقاطع عمقی ایجاد شده وتعیین شیب گسلش، مشخص شد که امتداد این شیب در سطح با هیچ‌‌کدام از چین‌خوردگی‌‌های سطحی ناحیه (فین و گونیز) برخورد ندارد لذا با توجه به این مطلب می‌توان گفت که چین‌خوردگی در سطح در این ناحیه مستقل از گسلش در عمق صورت می‌گیرد. The NW-SE-trending Zagros fold and thrust belt extends for approximately 1,800 km from a location some 300 km SE of the East Anatolian Fault in NE Turkey to the Strait of Hormuz, where the north-south-trending Zendan-Minab-Palami fault system (ZMP) separates the Zagros belt from the Makran accretionary prism. The NE limit of the Zagros belt is marked by the Main Zagros Reverse Fault which is rotated about a horizontal axis to form a steeply NE-dipping to sub-vertical reverse fault with a right-lateral component of movement of unknown magnitude (Wellman, 1966; Stöcklin, 1974; Berberian, 1995). The extension of the Main Zagros Reverse Fault to the NW of latitude ~33o is referred to as the Main Recent Fault (Tchalenko and Braud, 1974), and is a right-lateral strike-slip fault as indicated by earthquake focal mechanism solutions and field evidence (Talebian and Jackson, 2002; Bachmanov et al., 2004). There is no clear surface boundary to the frontal edge of the Zagros fold and thrust belt where folding is gentle both on land and beneath the Persian Gulf. However, the southern edge of the Zagros deformation front can be defined at different levels by the shape in map views of the oil- and gas fields (Talbot and Alavi, 1996), and also by the seismicity and topography (Jackson and McKenzie, 1984). The deformation within the Zagros fold and thrust belt is due to the relative convergence between Arabia and Eurasia since the Middle-Late Cretaceous era (Falcon, 1974; Stöcklin, 1974; Koop and Stoneley, 1982). However, the Zagros fold and thrust belt began forming during the main phase of the Zagros orogeny in the Late Miocene (Stöcklin, 1968; Stoneley, 1981; Hessami et al., 2001); current shortening at a rate of about 7 mm/yr (Tatar et al., 2002; Vernant et al., 2004b; Hessami et al., 2006) as well as active seismicity indicate that this deformation is still active. A moderate earthquake (MW = 5.9) struck the Fin region in the Hormozgan province on March 25, 2006 (07:28 GMT) with low damage. The main-shock was followed by 4 aftershocks with magnitudes larger than 5. Four stations were installed in the region for aftershock study. In this paper, the results from the‌ analysis of aftershock data recorded by these 4 stations and the neighboring dense network in the east are presented. Epicentral distribution of the aftershocks shows an E-W trend. Moreover, an alignment trending north consistent with the mainshock focal mechanism is clear at depth. This seismological evidence confirms that the Fin Earthquake occurred on a reverse fault dipping north. The epicentral distribution of aftershocks showed an east-west trend which indicates that the causative fault is in the east-west direction. Both focal mechanism solutions reported by the CMT catalog and body wave modeling results were also in agreement with this determination. A cross section view of the north-south direction showed a northward dip for the fault plane. There is no incidence between the strike of depth distribution of the aftershocks on the surface and the known folds of the region. Using these results, it was concluded that there is no direct relationship between depth faulting and surface folding, and that aftershocks were distributed lower than 5 km depth, which indicates that the Cretaceous Gurpi marls disallowed the faulting to reach the surface.